Walleye and waterfowl are two things that come to mind when outdoorsman around Minnesota hear the words Lac Qui Parle Lake. Lac Qui Parle has a tradition of being one of the best walleye fisheries in the state and the Lac Qui Parle Lake Association is helping in keeping that tradition alive for the anglers of Minnesota. The Lac Qui Parle Lake Association was created in 1982 as a non-profit organization. Since its inception, the Lac Qui Parle Lake Association has been involved in funding numerous lake projects as well as projects that help aid the outdoor enthusiast. The Lac Qui Parle Lake Association works in conjunction with the Minnesota DNR and has been instrumental in providing funding for walleye stocking programs, fishing piers, boat ramps and rip rap projects on the erodible shorelines of Lac Qui Parle Lake. The 2019 Ice Castle Classic will be here before we know it. The planning has begun and some people are more excited about ice than others! We will be having our annual raffle again this year, with the drawing taking place the day of the Ice Castle Classic. Tickets will be $20 per ticket. There will be over $9,000 in cash prizes, plus the Grand Prize a 2019, 8 x 16 Walleye Angler valued at $20,000! The tickets are printed and will be for sale shortly! Tickets will be available from any Lac qui Parle Lake Association Board Member, Runnings in Montevideo, Ice Castle in Montevideo, and Mitlyngs Bait and Tackle. CLICK ON ICE CASTLE RAFFLE TAB FOR A COMPLETE LIST OF WINNERS! Walleye Tournament June 9th, 2018! Click Tournament Tab For More Information. ​Fall 2015 Lac Qui Parle Lake Walleye Stocking! Stocking of young of the year walleyes on Lac Qui Parle Lake this Fall. Fish measured 7-9" in length. Bottom left pectoral fin is clipped. Please continue to watch for these fin clipped fish in the years to come. LQP Lake Association has a goal to stock 25,000 walleyes. To become a member of the LQP Lake Association go to www.lqplake.org and download a membership form. ﻿**We would like all those fishing Lac Qui Parle Lake to keep an eye out for fin clipped walleyes being caught. If they have a fin clipped on the bottom left of the fish, they were stocked as a young of the year fish. 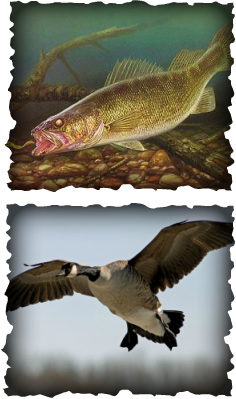 Please let us know if you catch any of these fish, by emailing minnkotatackle@yahoo.com. This photo was taken last year during fishing league weigh-ins. All three fish were 14", fin clipped and caught by the same team. This is a photo from October of 2015. Notice that these stocked fish have the opposite fin clipped as the 2014 fish that were stocked. This photo was taken on June 7th, 2014 of a walleye caught during the Bothun Fishing Tournament on LQP Lake. Another example of a fin clipped walleye.